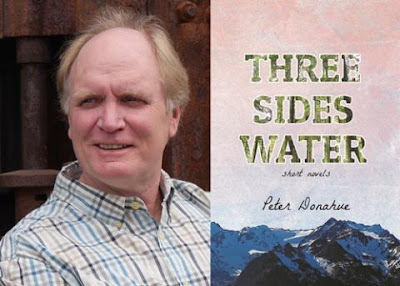 In the sixth in a series of posts from authors of 2018 books entered for The Story Prize, Peter Donahue, author of Three Sides Water (Ooligan Press), discusses the importance of writing on the sentence level and his efforts to improve his own. I remember in my early twenties having a wild revelation. “I can write sentences,” I exclaimed to myself as I sat at my borrowed Selectric II typewriter. I was an English major brimming with undergraduate hubris. I was also writing more sentences than I ever had, and the exclamation was my first real recognition of—and wonder at—sentences qua sentences. In the first-year composition classes I teach today, I try to foster this recognition in my students. 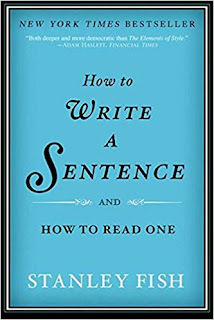 I quote from Stanley Fish’s How to Write a Sentence: And How to Read One: “If you know sentences, you know everything. Good sentences promise nothing less than lessons and practice in the organization of the world.” It’s a good motto for composition students. It’s a good motto for all writers. Yet it has its limits. The world can be overly organized and badly organized (really badly), and so we also need sentences that undo the world. I’m not just talking about literary ambiguity here. I mean oblique, awkward, confounding sentences, the sort generated by anarchic syntax, unruly punctuation, and unapologetic diction. Sentences, for example, by Henry James, Theodore Dreiser, and William Faulkner (as well as, coincidentally, first-year composition students). Poets have an upper-hand in this undoing. Here’s one I like from Emily Dickinson (minus virgules and capitals for new lines): “We know not that we were to live—nor when—we are to die—our ignorance—our cuirass is—we wear morality as lightly as an Option Gown till asked to take it off—by his intrusion, God is known—it is the same with life” (1462). It’s a sentence—or four or five fused with her famous dashes—that simultaneously organizes, disorganizes, and reorganizes its theme. To make it neatly parse-able through prescriptive grammar would be to drain it of its force and acuity. For most of my writing life, clarity, concision, and grammatical correctness have been my touchstones. I internalized early Orwell’s edict that “Good prose should be transparent, like a window pane.” I wanted to write in the great Plain Style tradition of Willa Cather, Sherwood Anderson, and Raymond Carver. Never once, however, has a reviewer commented on my scintillatingly clear, painfully concise prose. Compelling story? Sure. Complicated characters? Check. Vivid setting and historical verisimilitude? Absolutely. But never a peep about my prose—that is until one reviewer called me out for writing “pedestrian prose.” This stung. So I started rethinking my notion of prose style, at the sentence level, and while I can’t say I’ve radically transformed my sentences since then, I certainly risk more with them now. This means skewing syntax, going excessively long or short, dicing and splicing, getting funky with diction, and throwing out the style manual on punctuation. In other words, taking more chances. It also means, paradoxically, taking more care. I never worked so painstakingly on my sentences as I did in Three Sides Water (with help from several keen line editors), and the difference has been noticeable. A reader recently came up to me at a gathering and read off several random sentences from a sheet of paper. I didn’t know what to say. First of all, I couldn’t get over the fact that she’d bothered to identify and copy out favorite sentences from my book. Secondly, I was aghast that I hadn’t recognized them. But when she handed me the sheet of paper and I read the sentences printed on the page, seeing how each was constructed, it was like a reunion with old intimates. I could practically recall the composition and editing process of each one. 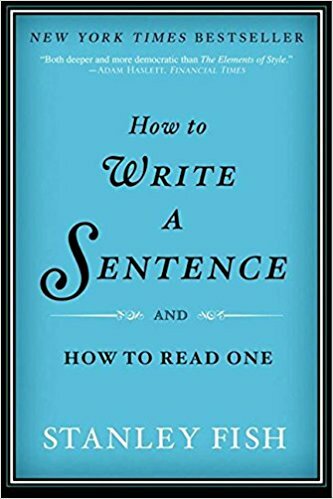 “All you have to do is write one true sentence. Write the truest sentence that you know," said Hemingway, the paragon of parataxis, in A Moveable Feast. I like this notion, though I’m not sure what it means. Perhaps a true sentence simply feels right, as though every element were preordained. If so, I’m not sure I’ve ever met such a sentence in my own writing. The more I write, the more I realize how little I know. So I’m going to keep aiming to untrue my sentences, twist and slant them, and see where this takes me.